The gap between tier one and tier two rugby nations is predicted to keep closing after big changes were announced to the global test calendar. From 2020, there will be a big increase in matches between top and second-tier nations, including a commitment from England and France to play in the Pacific. Southern Hemisphere teams have committed to hosting tier-two teams in the new July test window, while Six Nations sides have guaranteed to host a minimum of six matches against second-tier teams in November. Tonga head coach Toutai Kefu said more test matches against tier one nations can only be good for Pacific Island countries. "It's a way in progressing and advancing those tier two nations. Simple way of us being exposed to better teams, harder football, more consistent football, which makes us better, more competitive," he said. "The more rugby we can play against the tier one nations on a consistent level the better for us - exposes us to better players, better teams, harder rugby and we're only going to benefit from that more and more in the more frequent that happens. "But in saying that, those tier two nations: the Romania's, the Canada's and the Georgia's, they're just getting better and better. "I think it just closes the gap between top teams and the bottom teams whereas you go back to the World Rugby Cup when it first started....there was probably only one or two teams that could win that. "Whereas now outside the All Blacks the gap is closing between the top 15 teams I think and becoming more competitive." Kefu said hosting Northern Hemisphere sides like England and France in the Pacific was a big step for the region. "Rugby in the islands is their number one sport so it brings those big teams to our door-step and it gives an opportunity for our fans and local supporters [to get] up-close access to come and watch these big test-matches," he said. "Whereas in the past it's always been overseas, northern hemisphere on TV so it gives them a bit of reward, the fans, for being loyal but it also gives us the opportunity to play them in our backyard and it improves our chances of winning, definitely, I think." "Teams do tend to struggle down in the islands - just I think with the environment and the heat and the humidity," Kefu said. "We were desperately hoping we were going to get the Welsh game there [in June to be played in Nuku'alofa] but to no avail but hopefully that's a signal to our government to try and hopefully get that field [at Teufaiva National Stadium] ready in the future." Wales will now play the 'Ikale Tahi in New Zealand at a yet to be confirmed venue before travelling to Apia to take on Samoa. Photo: PHOTOSPORT England and France have both agreed to tour the Pacific Islands from 2020. 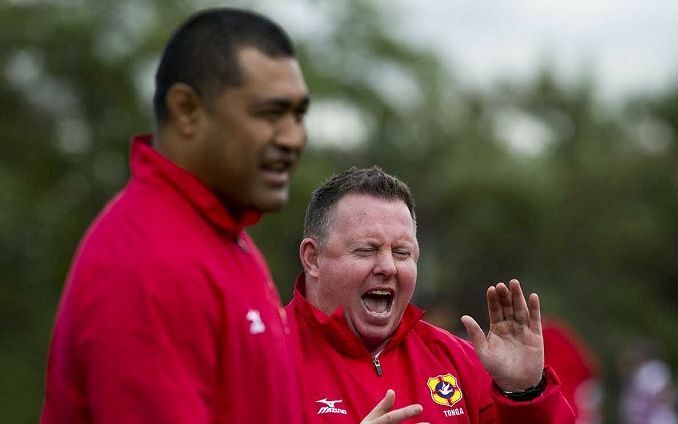 Photo Below: Tonga Rugby Union Tonga coach Toutai Kefu and assistant coach Matt O'Connor.